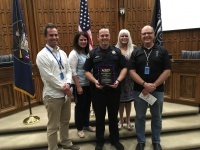 Our very own Officer Austin Rowberry was given the Special Operations Division Commander Award at the 2016 Baker Award and Service Awards Ceremony for the Provo Police. We are so lucky to have Office Rowberry at our school with us each day. He does so much for our students, teachers, staff and administration. He makes everyone around him feel safe and welcome in his presence. We appreciate his service to our school! Thank you Officer Rowberry from all of us at Independence!